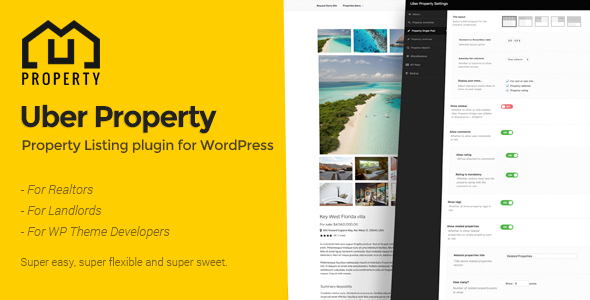 Uber Property is property listing plugin for WordPress. You can pretty much use it to list any type of property, be it a house, condo, parking lot, tent, car, boat – anything that can be sold or rented. It is due to the fact that the property amenities list is created via plugin options, while amenities get assigned per property posts at will. Create thousands – assign only the ones you need! Crazy good and simple search is what makes Uber Property stand out! No need for a bunch of confusing checkboxes and drop-downs. The search itself is precise and organic. Uber Property is flexible enough to “withstand” any WP theme. Default templates can easily be overwritten within your theme’s folder – if required so. Many available content hooks allow further customization for developers. Try before you buy – create your own demo site! Please visit Uber Property demo site.